On September 21, 2018, the Covenant Health Knoxville Marathon presented a total of $10,000 in grants to five local organizations to support health living in East Tennessee. Grant recipients include Girls on the Run of Greater Knoxville, Knoxville Sled Bears, Bike Elf, Free Medical Clinic of Oak Ridge and PJ Parkinson’s. 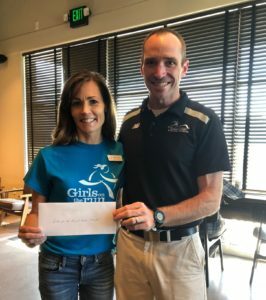 Girls on the Run of Greater Knoxville received $3,000 for its “Limitless Potential” campaign, which provides scholarships at schools that serve at-risk children. The scholarships are used for enrollment of girls in grades 3-8 in a transformational youth development and physical activity program. The Knoxville Sled Bears received $2,600 to help provide individuals with physical disabilities the opportunity to play hockey and engage in a team sport. The funds will be used to purchase the necessary equipment. Bike Elf received $1,750 to help provide bicycles to children and young adults in East Tennessee who might not otherwise have access to one. The funds will cover the cost of parts and materials to refurbish donated bicycles. Free Medical Clinic of Oak Ridge received $1,650 to help support its “Healthy Habits, Healthy Lives” program. The funds will provide participants with wellness resources and participation incentives and help cover the cost and supplies of smoking cessation classes. PJ Parkinson’s Support Group of Blount County received $1,000 to support its ballroom dance class initiative for individuals with Parkinson’s disease and those facing dementia. The group partners with the Alzheimer’s Association to provide the classes to adults free of charge. 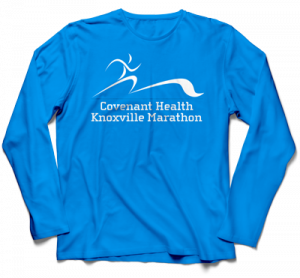 Although 2018 was the fifth year for the Community Contribution Program, the Covenant Health Knoxville Marathon and the Knoxville Track Club have a long-standing history of reinvesting in the community. From 2005 – 2018, $170,000 has been contributed to support projects such as mile markers for local city and county greenways, land acquisition and building trails in South Knoxville’s Urban Wilderness, and a golf cart to patrol and clean the greenways. Past recipients include East Tennessee Children’s Hospital, Legacy Parks Foundation, Young-Williams Animal Center, Ijams Nature Center, YWCA Knoxville, Knox County Schools, The Muse Knoxville, and Keep Knoxville Beautiful. 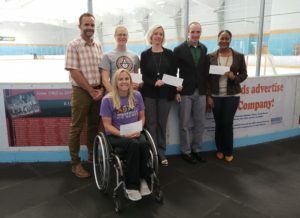 An additional $39,331 has been given to the Patricia Neal Rehabilitation Center Innovative Recreation Cooperative, which encourages people with disabilities to pursue leisure and sports activities including hand cycling, which is one of the races in the Covenant Health Knoxville Marathon.